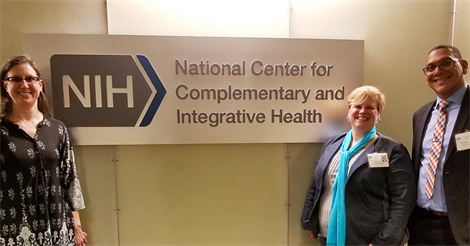 American Massage Therapy Association (AMTA) representatives James Specker, Director of Government and Industry Relations, and Ann Blair Kennedy, Governance Committee Chair, and I met with leaders at NIH’s National Center for Complementary and Integrative Health (NCCIH, formerly NCCAM). The meeting was arranged by AMTA to speak about the importance of massage therapy research related to the current and future funding landscape and NCCIH priorities. AMTA was interested in how they and others in the massage field could better position themselves to move massage research forward and bring massage’s potential benefits to broader communities in need, such as those related to the opioid crisis. Part of NIH’s overarching mission is, “to seek fundamental knowledge about the nature and behavior of living systems and the application of that knowledge to enhance health, lengthen life, and reduce illness and disability.”1 NCCIH exists in large part to help build the evidence about the value of massage therapy and other complementary and integrative approaches in order to help guide federal policy to ensure access to care for the programs under its purview. NCCIH values and has potential support mechanisms in place for emerging researchers who have practitioner training and experience. This signals a bright future for massage research development and collaborative opportunities in the practice. 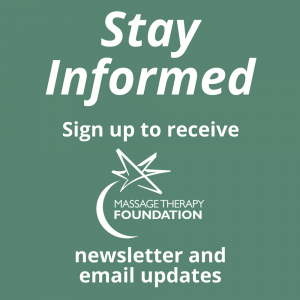 There is much work to be done and more massage field-affiliated professionals are needed in academic and research positions. Organizations such as AMTA and the Massage Therapy Foundation could be instrumental in further developing a strong research culture in our field with their continued interest in advocacy and funding for massage-related research in addition to increasing focus on research training and career pathway development for practitioners. Click here to view the extended version of this blog.